Are looking to add that real 'wow' factor to your end of financial year business function? then look no further. Do you know what is one of the biggest factors P.A's look for in booking a business conference? Distance from work. Studies have shown if you are not physically connected to work by proximity then you are more likely to focus. Less time checking emails and looking at phones. 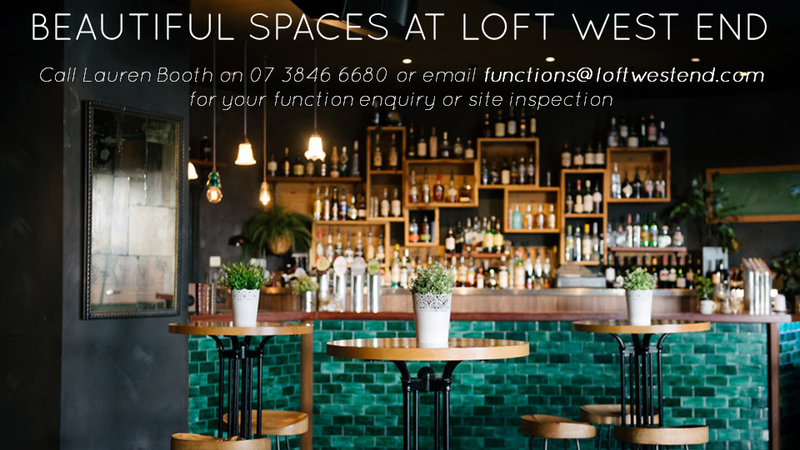 The loft West End is the ideal destination. No white walls or boring hotel food here. Select from fresh baked scones, banana bread, croissants and fresh fruit platters or eggs benedict. Or try our sandwich stations or Italian inspired lunch including antipasto platters, pasta three ways and a selection of salads. Loft West End also have food and beverage packages for 3 course sit down meals or cocktail style to celebrate your year in style. As Richard Branson says "look after your staff, and they'll look after your customers". Click here to find out more or call Lauren 07 3846 6680 now!